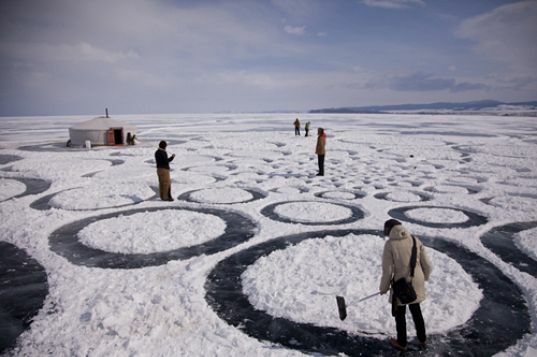 World's Largest Artwork Created on Frozen Lake Baikal! 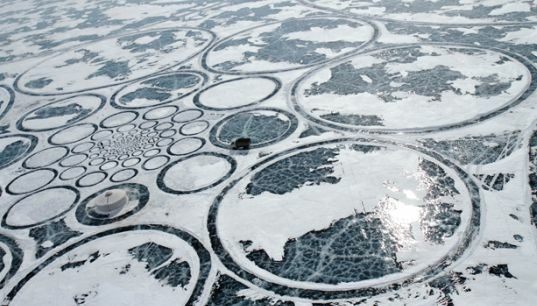 World’s Largest Artwork Created on Frozen Lake Baikal! The incredible concentric forms you see above are neither crop circles nor alien landings -- they are part and parcel of the world's largest artwork, which spans nine square miles! Jim Denevan, who created the previous worlds-largest-artwork in the Nevada desert last year, headed out to Siberia this year to draw these beautiful patterns on ice with a team of helpers and a broom. Denevan is known for creating expansive, meditative works with repetitive patterns and endless scale. Given that, Lake Baikal seems a pretty danged appropriate canvas -- it's the world's largest lake. And even when the harsh Siberian winds carried the resulting artwork to the clouds, the momentary grace of the work is stunning. Read on to learn more about this amazing artwork carved into the frozen tundra. A team of eight people committed to walking in circles for art, including a documentary filmmaker and a photographer. Given the ethereal nature of the piece, it’s not surprising how important documentation is to the process. After all, ice is one of the most potent artistic materials of our modern age. The team lived in a yurt in the center of the lake, building a fire on the lake bed every night (it would re-freeze every morning). Though the artwork melted away in May, the experience is chronicled on The Anthropologist, a site for promoting new work by Anthropologie. Yep. The folks who put together those massive store displays sent eight people to Siberia to draw circles. And thanks for that. How beautiful! couldn't help thinking how amazing it'll look if we could backlight it. would the ice be too thick to be backlit? I love this, such a brilliant idea, photography is great! I see your peninsula ;) but semantics aside, the article he linked to says itself "most voluminous", not largest. The article I linked to (Lakes by area) uses the language "Largest lake" which I'd say would have been the more broadly accepted interpretation. I do like it when we can all be right though! All this aside though, I forgot to say how neat the art itself looks, wonder if Google will capture it on Google Earth before it disappears?!?! Minor correction: Lake Baikal is actually not the \"Largest Lake in the World\", it\'s the largest lake in Asia, however only number 6 in the world. http://en.wikipedia.org/wiki/List_of_lakes_by_area Cheers. A team of eight people committed to walking in circles for art, including a documentary filmmaker and a photographer. Given the ethereal nature of the piece, it's not surprising how important documentation is to the process. The team lived in a yurt in the center of the lake, building a fire on the lake bed every night (it would re-freeze every morning). Ice is one of the most potent artistic materials of our modern age. Though the artwork melted away in May, the experience is chronicled on The Anthropologist, a site for promoting new work by Anthropologie. The massive art installation stretches on for nine square miles. Yep. Anthropologie sent eight people to Siberia to draw circles.